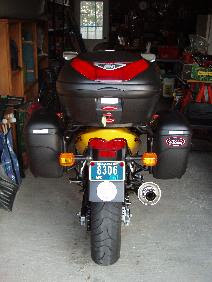 Here are two shots of the back of my bike taken in my garage, showing how a few strategically placed bits of SOLAS can increase visibility. 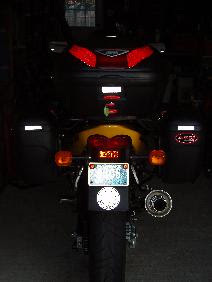 The top photo is in daylight and the photo at bottom is in darkness with a flashlight shining on the bike from the rear to approximate a following vehicle's headlights. Using your fingers on your monitor screen, go ahead and cover up the SOLAS on the side cases...see how they just about disappear? That's not good, particularly if some bonehead driver tries to go around me a bit too close. The two "wings" that are lit up on my top case in the bottom photo are normally just red reflectors. The middle bit is where an optional brake light would be and so the lens isn't reflective. I removed the entire lens assembly and replaced the white paper backing behind the reflectorized portions of the lens with...you guessed it: SOLAS tape.